JNN 19 July 2015 : Muslims around the world are celebrating the three-day Eid al-Fitr festival, which marks the end of the fasting month of Ramadan. with group prayers and large family gatherings. Marking the end of the holy fasting month of Ramadan, Eid al-Fitr is one of the centerpieces of the Muslim calendar. It features large public group prayers and extended family gatherings. The beginning and end of Islamic months are determined by the sighting of the new moon. Many Arab countries including Saudi Arabia, Gulf States , Syria , Australia , Germany and Indonesia have declared Friday the first day of Eid, but in Pakistan , India ,UK, Oman ,Morocco, Sri Lanka, and Bangladesh, Morocco, the Month of Shawal will start on Saturday. Parents often buy gifts and new clothes for their children. Public squares, parks and zoos across the Muslim world become packed with visitors and picnickers. With large-scale prayer services and family gatherings, Muslims around the world began celebrating Eid al-Fitr on Friday morning. The three-day Festivities marking the end of Ramadan is a time of gratitude and festivity, when many observe the holiday in their own ways across the globe. The holiday is celebrated in many ways by Muslim cultures all over the word. The attached photos compiled of Friday’s celebrations to see how Muslims in Afghanistan, India, China and elsewhere celebrated the holy day. Syrian President Bashar al-Assad attended Eid ul-Fitr prayers on Friday in a Damascus Mosque. The prayers in al-Hamad Mosque were attended by senior state and Baath Party officials, Minister of Awqaf (Religious Endowments), Grand Mufti and a number of Islamic scholars, along with a crowd of people. Following the prayers, President Assad listened to the Eid sermon delivered by Sheikh Mohammad Sharif al-Sawwaf, who led the prayers. “Our country, the Levant, has been blessed by God, and it has remained present and kept being renewed over more than ten thousand years despite the events and calamities it went through,” said al-Sawwaf. “It is this same blessing that has kept Syria firm and proud today after almost five years during which it faced the fiercest barbaric attack,” he added. By doing so, they were the first Muslims to witness the first moments of the festival, depending on the geographical location of Australia, which is six hours ahead of Coordinated Universal Time (UTC). The main prayer was held in the Imam Ali Mosque in Lakemba, a suburb in south-western Sydney, while also dozens of prayers were held in prayer rooms in large closed halls in all Australian states because of the winter weather which prompted the replacement of public squares and parks. This year’s Eid sermons focused on the unity of Muslim communities in Australia, and warnings against those who are pursuing to sow discord among Muslims, in a clear allusion to the anti-terrorism laws that the government is trying to apply. It is noteworthy that there are between 205-300 mosques and Islamic centers across Australia. 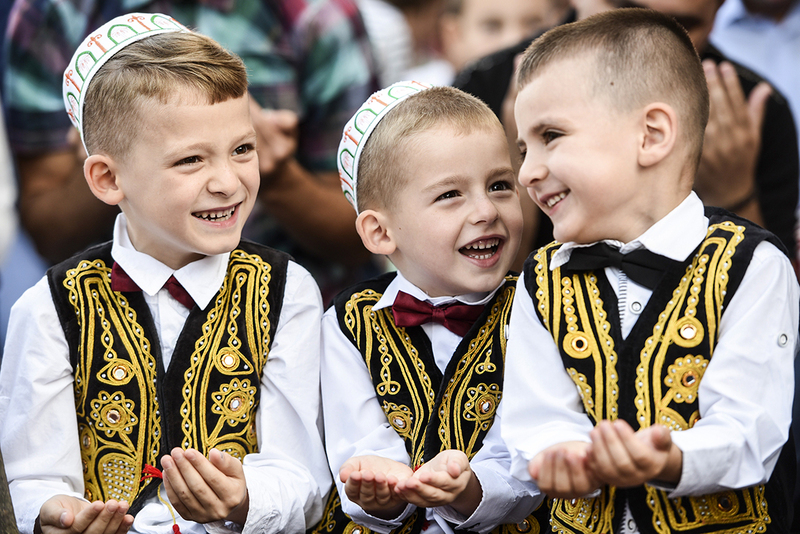 After 30 days of fasting, prayer and worship, Albanian Muslims today celebrated Eid Al-Fitr. They assembled at Boulevard “Martyrs of the Nation” for performing the Eid prayer. During this celebration, the chairman of the Muslim Community of Albania, Skender Brucaj congratulated believers and all Albanians throughout the world for the feast of Eid al-Fitr, which is the symbol of peace, spiritual peace and harmony. Brucaj also wished more prosperity, peace and tranquility for Albanians. On this occasion, the Albanian President, Bujar Nishani conveyed a message of congratulations of Eid Al-Fitr to all Muslims worldwide. The sermon marked the beginning of the Eid al-Fitr holiday and the end of the fasting month of Ramadan. The broadcast was part of a wider two-hour coverage on the Muslim holiday that included the sermon, narration of the Islam’s holy book Quran, Islamic chanting, and speeches by Christian Catholic and Protestant priests. Ahead of the sermon, Benjamin Idriz, the preacher who led the prayers, said the move was historic for Muslims in Germany. “In the sermon, I will deliver messages to both Muslims and non-Muslims in Germany. I will talk about the common values, and will urge the German society to open up to Muslims and visit their mosques, and also urge Muslims to open up to the German society,” the Macedonian-born German preacher said. The emergence of extremist groups like the Islamic State of Iraq and the Levant (ISIL) has added psychological pressure on Muslims in Germany, the 43-year-old preacher said. He said that broadcasting the Eid program will help the Muslim community feel more welcome and as an integral part of Germany. This entry was posted in Europe, Jafria, Lebonan, Middle East, Pakistan News, United States and tagged Africa, Australia, Eid ul-Fitr, Europe, pakistan. Bookmark the permalink.